The Wreck - unvarnished and raw, just like the real thing. You may expect some hammers that strike two adjacent notes at once and some badly out of tune notes. The Tamed Wreck - a softened version where individual notes are tuned to the best perceived average and pulled into equal temperament. Hammers that strike two different notes at once are removed from this set. 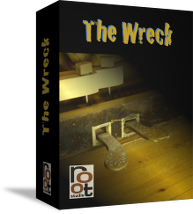 The Wreck FX - a few strums across the strings for your mystery movie scoring pleasure.